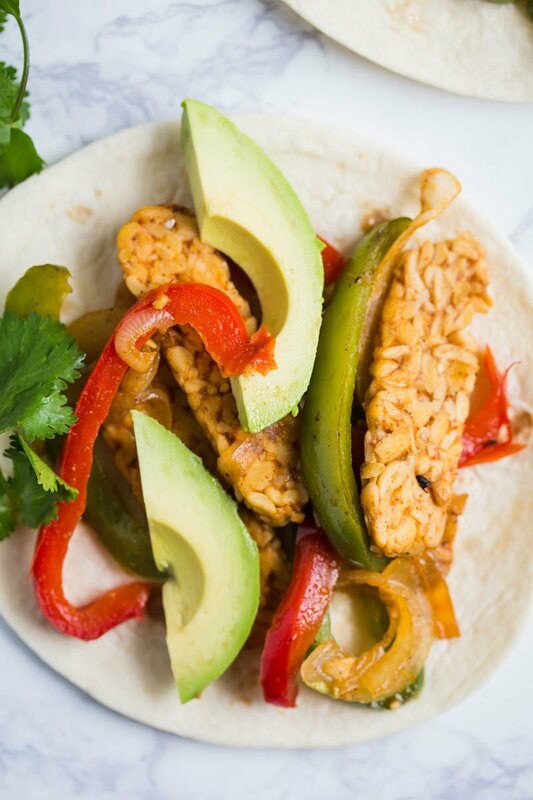 THESE Tempeh Fajitas have been on my mind for the past year. I had never really tried tempeh before recently and pretty much immediately fell in love with it. I’ve found it very handy with Mr. Britnell wants meat for dinner and I don’t. We’ll typically just make the same dish for both of us, simply swapping out the meat for tempeh. My dish always comes together much quicker seeing as tempeh cooks in no time. 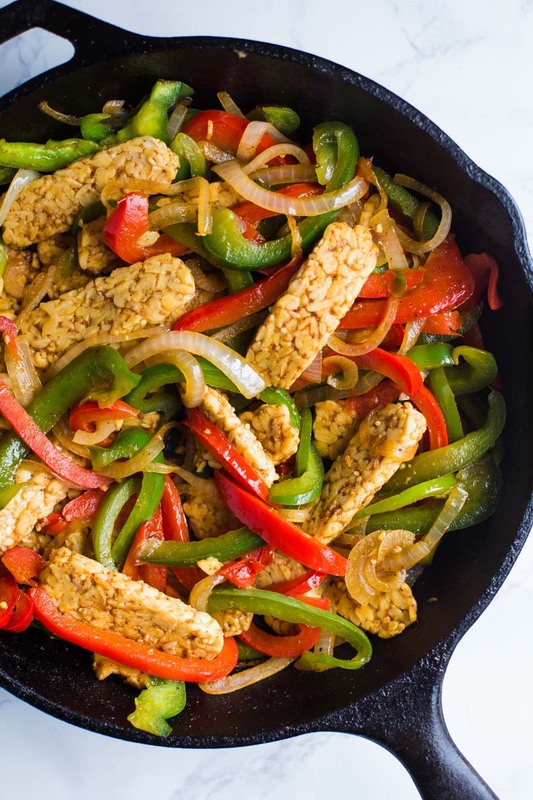 So, these tempeh fajitas are basically just regular fajitas but with tempeh in them. I like my fajitas VERY simple. 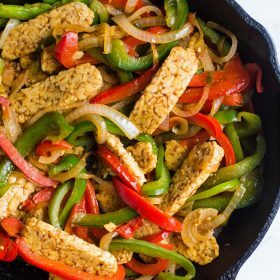 Peppers (color depending on the season and how cheap peppers are at the time), onion (typically sweet yellow onion), spices, and (in this case) TEMPEH! To really enhance the flavor, we’re marinating the tempeh in the spices for a bit. 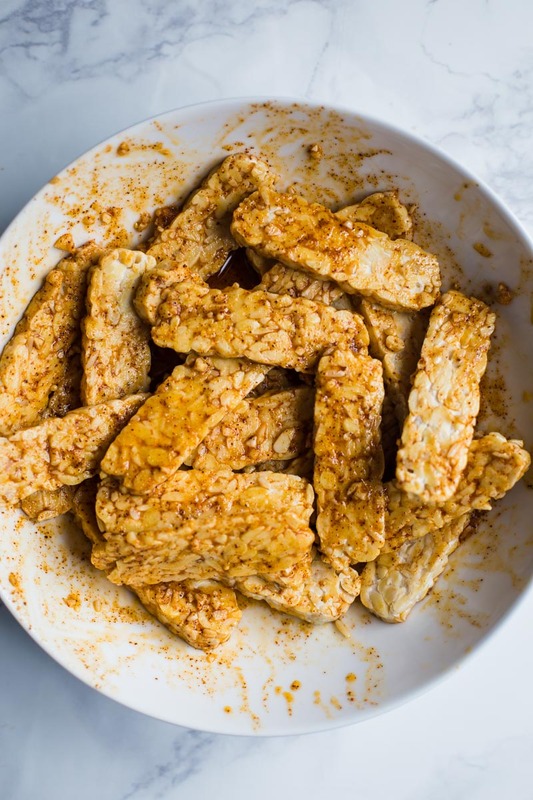 Unlike meat, tempeh soaks up all the flavor in NO time. So, it’s not really necessary to marinate these for too long. I’ve done it for as little as 10 minutes before and it turned out great. And in case you’re curious, these fajitas are great reheated! 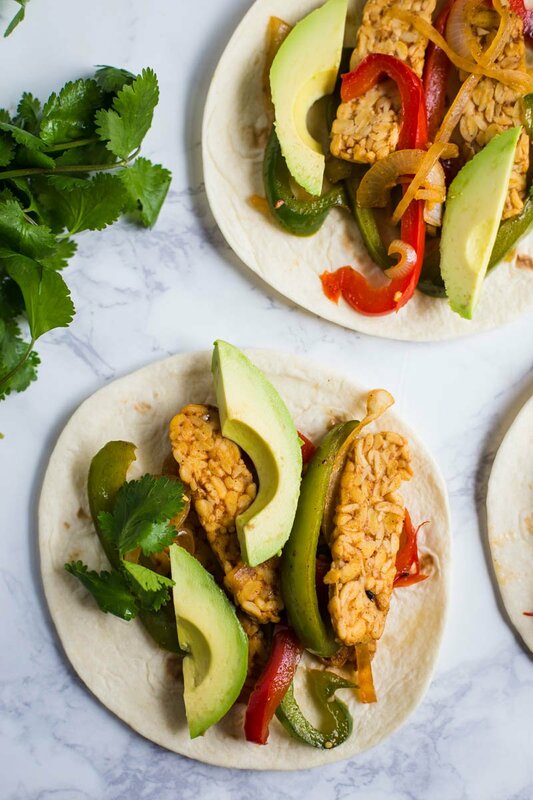 I ate on them for a few days, simply reheating the tempeh and veggies and throwing it all inside a tortillas. Super quick and easy lunches! Optional for serving: tortillas, guacamole, sour cream, cheese. keep it simple! In a medium bowl, mix together all of the marinade ingredients. Add in the tempeh slices to the marinade and toss until each piece is covered in the marinade. Let sit for 30 minutes. When ready to cook, heat the oil in a large skillet over medium heat. Add in the onion and the bell peppers. Salt and pepper a bit to taste. Cook for 8-10 minutes until the onion is translucent and the peppers are beginning to get tender. Add in the tempeh and toss with the peppers and onions. Cook until the tempeh is heated through thoroughly. No more than about 5 minutes. Next Post » The announcement I’ve been waiting to make!